This course is intended for those who have never been canyoneering along with those wanting to refresh their understanding of the many core concepts. The basics are a critical starting point for every responsible individual entering the canyons. Throughout the course you will learn to identify and understand core concepts of trip planning, equipment, rappelling, anchor rigging, canyon movement, overall general safety and much more. 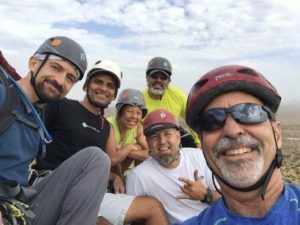 The goal of this course is to convey the core concepts of canyoneering, through study and practical application, so you can become a contributing team member while in canyon with competent leaders and mentors. Class size is limited to 10 students and 2 instructors. The logistics of the class, particularly the weekend training activities in-canyon, dictates a strictly limited class size. Experience required: AMC Outdoor Rock Climbing School and AMC Anchors School or equivalent experience. This includes solid basic rock climbing, belaying, and rappelling skills, all basic climbing knots and the ability to build solid trad anchors. These skill provide a solid foundation for a transition to canyons and the specialized skills and techniques unique to canyoneering. *NOTE: No extra gear is required beyond that required for the prerequisite AMC Basic Rock & Anchors schools. Note: You must be a current AMC club member to register for this school. Payment may be made by credit card, cash or personal check. If you are a current AMC club member (i.e. your dues are paid for this year), great!! If not, please go to the membership page at http://arizonamountaineeringclub.net/membership/ and complete the membership process. Refund policy: The cost of the class is fully refundable if you decide to cancel. The Club Membership Fee is non-refundable. Specific payment arrangements (PayPal, cash or personal check) will be provided to the individual students when the registrant list is finalized. Please go to the AMC Meetup site to add yourself to the RSVP Waitlist if you want to enroll in this school. You will receive further instructions via the Meetup event.